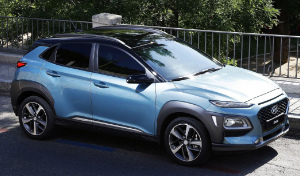 Hyundai Kona (OS). 2017 to date (prod. n/a). 5-door SUV. F/F, F/A, 998 cm³ (I3 DOHC), 1582 cm³ diesel, 1591, 1999 cm³ petrol (I4 DOHC). Hyundai’s challenger to the Nissan Juke for Korea, Australasia, North America and Europe, fighting in the markets where the Hyundai ix25 wasn’t present. Styled by Luc Donckerwolke, low and wide in looks on the outside; head-up display, wireless smartphone charging and Apple Car Play inside, although the roomy interior appeared dull with hard plastics. Comfortable ride but uncommunicative steering on Korean-market models.